Melt Fat Awayin just under 30 minutes from your Waist, Hips, Thighs, Arms and even under Chin! NO Downtime * NO Pain * NO Surgery Just imagine Inches lost in First Session! LipoMelt uses unique red light to help naturally slim, shape and tone areas…your LIPOSUCTION ALTERNATIVE! The unique wavelengths of LipoMelt stimulates fat cells to release their contents which is then easily and naturally eliminated by the body. The light emitted from LipoMelt causes the fat cell membranes to temporarily alter the permeability of the cell wall. This brief change allows some of the fat contents to seep out to where it can then be processed by the body. 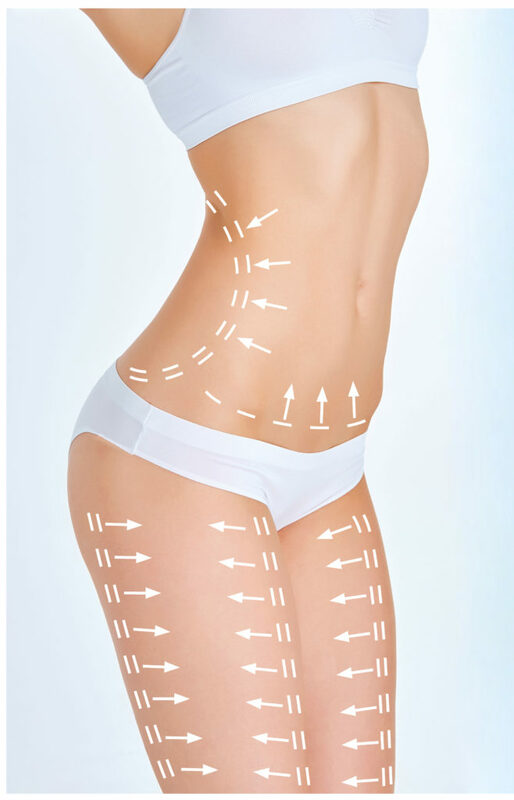 It also uses near-infrared light to increase collagen and elastin formation while contouring the body and creating a slimmer appearance….so you lose inches, fat, as we tighten skin.It is safe, effective, painless, non-invasive, and non-surgical!LipoMelt has also been shown to greatly enhance the body’s ability to heal itself while reducing pain and inflammation. It is safe and painless and results are often rapid with no side effects. ​After being released, the fat is broken down into free fatty acids and glycerol and enter the blood stream. Once in the blood stream, the fatty acids can be either used as fuel or quickly eliminated by the body. Non-invasive, LED-based light therapy is currently the highest in-demand treatment being sought by clients of today simply because of the healthy nature of the outcome. LipoMelt treatment offers the most effective option for anyone looking to eliminate body fat with ease. This is a great option for those with just one or two areas of concern… your SERENTE SPA’S LIPOSUCTION ALTERNATIVE! It also uses near-infrared light to increase collagen and elastin formation while contouring the body and creating a slimmer appearance. It is safe, effective, painless, non-invasive, and non-surgical. Clients typically require 8-12 sessions of 20 minute treatments, twice per week for amazing results! LED- LipoMelt system targets fat cells specifically, ensuring for an effective removal of fats especially in stubborn areas of the body that have been resistant to exercise and diet. When you do combine this safe and effective fat removal treatment with hydration and light exercise, the LipoMelt treatment will eliminate stubborn cellulites and fats permanently. This option is perfect for people wanting to lose inches in several areas…arms, waist,hips, thighs etc. It’s amazing to relax and nap during a 20minute session and watch inches melt away! LipoMelt therapy uses the most advanced red and near-infrared LED technology to naturally shape and tone the face. Wrinkles and fine lines occur as a result of the lack of elastin and collagen in the skin. An effective and powerful way of stimulating these essential skin proteins is by using red LED light which penetrates deeply into the skin, energizing the dermal cells and inducing the creation of elastin and collagen. The proteins collagen and elastin help to diminish wrinkles and fine lines by plumping up and firming up the skin respectively. ​Nobody wants to grow old. And the face shows the effects of aging more than anywhere else on the body. But many people don’t want to experience the pain, recovery and risks of complications associated with surgical face lifts. But now we can effectively reverse the signs of aging without surgery!